This is an archive of some previous events we have done. Since October 2016 we have been using Facebook for news of events and updates. See link to right. See Red were invited to show posters and attend this fantastic show of women’s graphics in Paris in spring 2016, coinciding with international women’s day, as part of the Fete du Graphisme 2016. Posters from See Red will be on display in an exhibition at The Fitzrovia Neighbourhood Association, 39 Tottenham Street, from June 25th to 28th 2015. 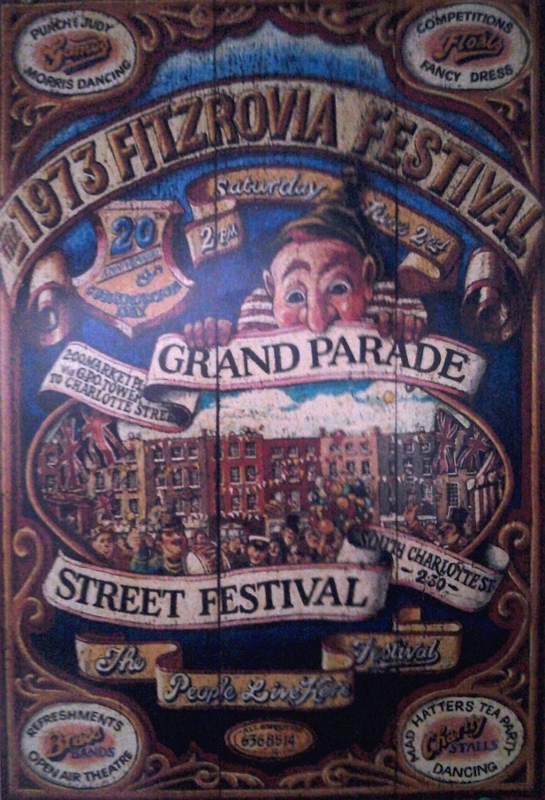 There is an article about the show by Sue Blundell in Fitzrovia News and click here for more information about the festival. On Friday 27th at 7pm, there will be a discussion entitled: ‘Radical Silkscreen Printing Collective’ led by See Red founder members, Suzy and Pru. The exhibition will be open 6pm to 9pm on Thursday 25th and Friday 26th June and 10am to 4pm on Saturday 27th and Sunday 28th June. 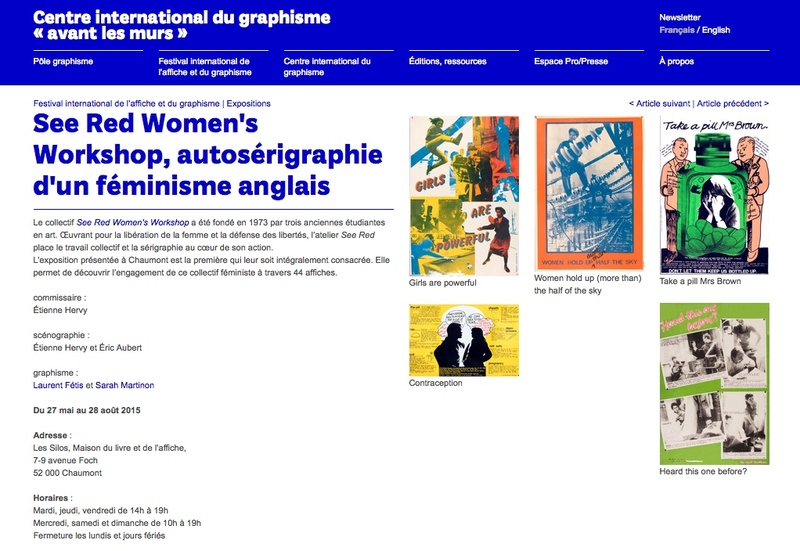 There will be a large exhibition of original See Red Women’s Workshop posters at the International Poster & Graphic Design Festival at Chaumont, France from Wednesday 27 May to Friday 29 August 2015. 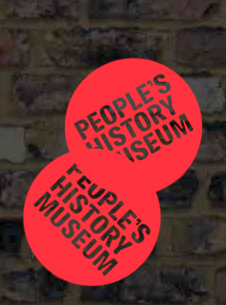 Founder See Red members Pru and Suzy will be in attendance talking about the posters and the workshop’s history. 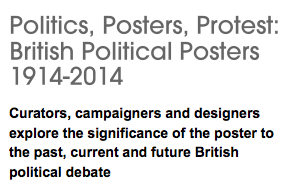 Topics will include the history of posters, design as activism, the management and manipulation of billboards, subversions and internet spoofs and the influence of new media on how political posters are conceived and deployed. In the Art & Design as Activism slot, Pru and Suzy from See Red are joined by Ross Colquhon (Designer and member of Artists and Creatives for Scottish Independence), Noel Douglas (Occupy Movement) and Clifford Singer (MyDavidCameron.com). Following on will be longstanding political artists Peter Kennard and Cat Picton on Art as a Political Weapon. The event is organised with the V&A museum. To mark the occasion of The East London Suffragette Festival, an exhibition of radical posters of women’s activism from various sources, including from See Red Women’s Workshop, will be on display. The exhibition will run for one week. An evening of extracts and shorts focussing on images of women’s struggle, political activism and filmmaking, celebrating the centenary of the East London Suffragettes. Doors open 7, for 7:30 start. Issue No.2 (winter 2013/14) of the wonderful OOMK publication shown above has an interview with two See Red members and reproduces several of our posters. OOMK is available from their website and various bookshops. Check their site for details and more about what they do. 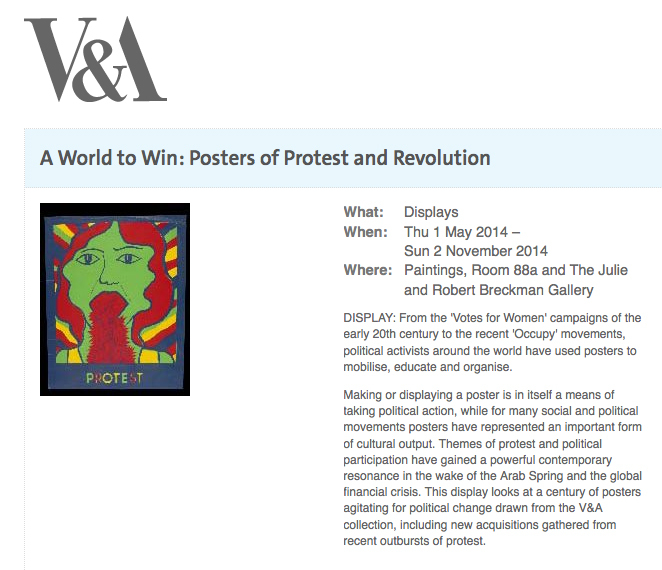 See Red posters are appearing in the forthcoming V&A display and touring exhibition A World to Win: Posters of Protest and Revolution as well our ‘Protest’ poster being used as the main image to promote the exhibition. See Red with Ciara Phillips at the Showroom. 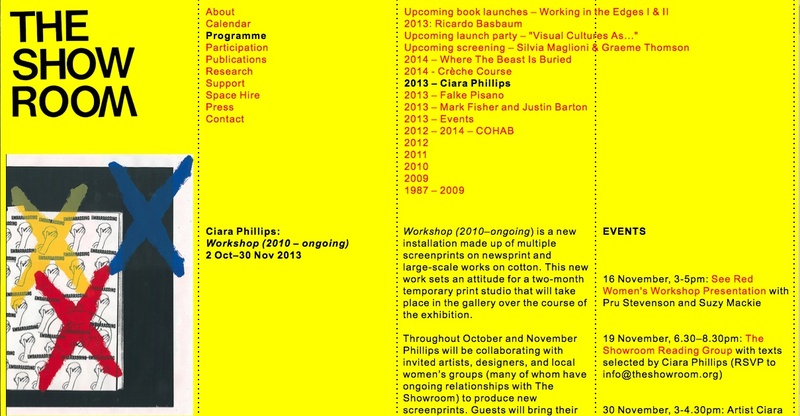 Artist Ciara Phillips invited See Red to come and speak as part of her project Workshop (2010-ongoing). Ciara has a long term commitment to working collaboratively with print and different groups. While she was at the Showroom she also worked with the group Justice for Domestic Workers. Have a look at the link to Showroom website for more information. Nearest tube: Aldgate East, buses: 15, 254,205, 25. 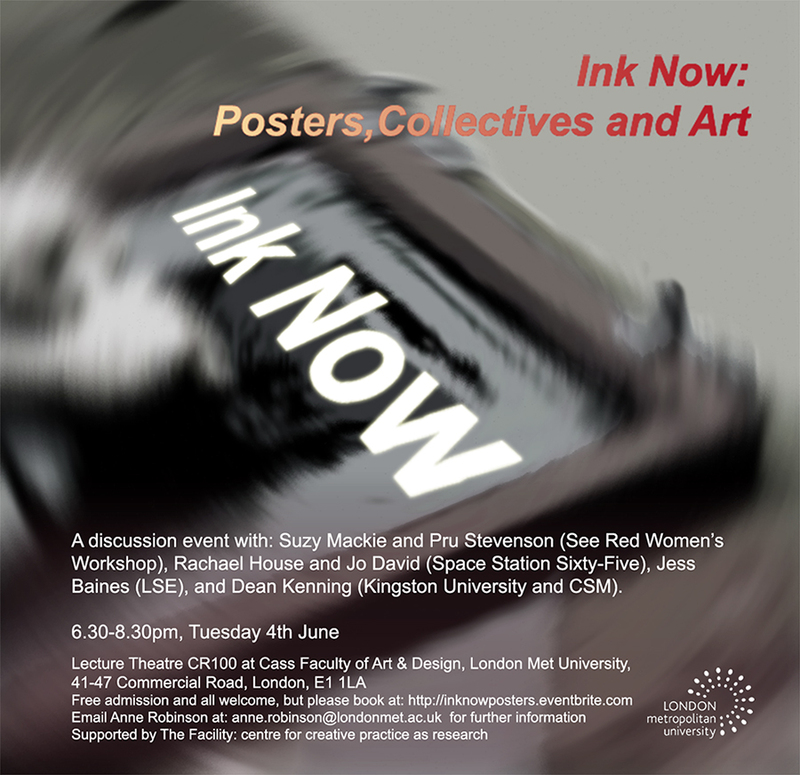 This is an evening of presentations and discussion about how posters have been used in different radical, political, feminist, collective and community settings. By looking at specific historical moments we hope to open up a conversation about radical ideas and collective practices in the contemporary art context. 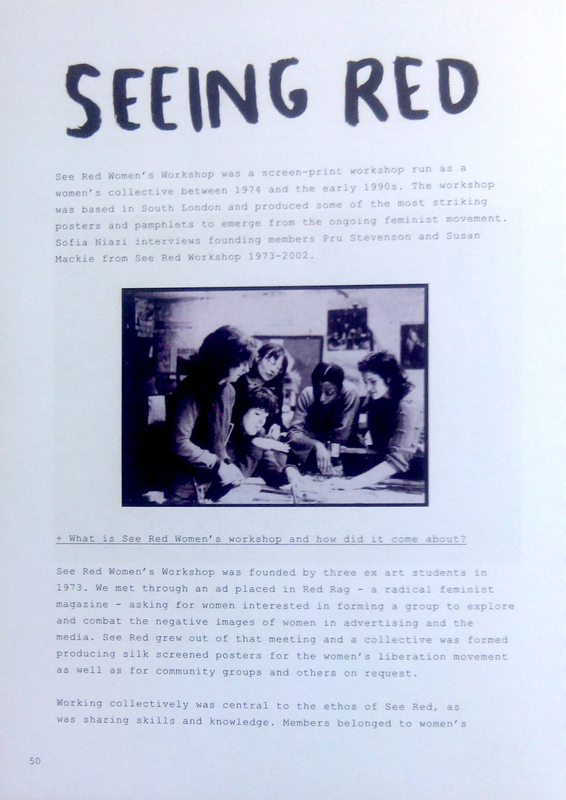 Suzy Mackie and Pru Stevenson, founding members of the See Red Women’s Workshop Collective, which produced silkscreened feminist and community posters from c1974 up to the early 1990s, will show poster images and talk about why and how the collective was set up and the first 8 years. Dean Kenning (Kingston University and CSM) will be talking about the recent show at Portman Gallery: ‘Poster Production’ where he worked with art students from Morpeth School, Central St Martins and Reading University, and with several contemporary artists to produce posters based on different themes and according to various methods of working. Rachael House and Jo David from artist run Space Station Sixty-Five on posters and archives in the art space, including poster-related shows such as ‘Shape and Situate’ ‘Rachael will also talk about her recent exhibitions ‘Feminist Disco’ and ‘A Space of Potential’ which draw on feminist cultures’? Each of the speakers will make a 20 minute presentation followed by an open discussion with time for questions.